Ashleigh has a passion for the care and welfare of animals and has been working with them for over a decade now. In her free time she loves to spend time with her wife and their dogs. Other hobbies she enjoys are fishing, hiking, swimming and traveling. Ashleigh is proud to be a part of the Chattaneuter team and enjoys being able to help our community with affordable spay/neuter and vaccinations. Colby just graduated from the University of Tennessee at Chattanooga in 2018 and plans to further her education by applying to vet school. She's always had a passion for animals and enjoys being a part of the Chattaneuter team and giving back to the community. In her free time she enjoys being outside with her two dogs Peyton and Addison. Sarah is Chattaneuter's own Georgia Peach. She joined our team in December 2018. Her country living provides a rural home cooked knowledge for her clients. She has recently moved to the city with her four legged son, Charlie. She loves spending time with her husband and family. In her spare time she enjoys going to car shows with her husband. Sarah also loves Chattaneuter's mission to provide low cost spay and neuter for the community, helping to prevent homeless animals and control the over population. Grace has been with Chattaneuter since February 2018, and was previously a pet sitter and stand-up comedian for four years. She is continuing her education in Theatre and loves providing laughs for the staff and clients of Chattaneuter. She loves that Chattaneuter provides low-cost services to a community that needs fewer homeless animals. Haley has been with Chattaneuter since its establishment and loves her dog Cooper! She also spends lots of time with her boys Jimmy and Colton. Amber loves being a Vet Assistant, and enjoys spending time with her family and their dog Bodhi. Stefanie graduated with a degree from the Veterinary Technician program at Chattanooga State. Her passion for animal welfare was found while managing the clinic at McKamey Animal Center. As the clinic manager she managed incoming animals, treatment of sick patients and daily surgeries. She continued her work through private practice and now spay/neuter. She has been with ChattaNeuter since day one and continues to show her passion for animals as the clinic director. Her family Nathan, son Atticus and her dog Ryder are also part of the ChattaNeuter family. She’s proud that ChattaNeuter offers high-quality spay and neuter for their clients and continues to promote and honor the mission. Dr. Rhyne has 37 years of experience in veterinary surgery. She graduated from veterinary school at the University of Tennessee at Knoxville and went into private practice in the Chattanooga- Cleveland area for 34 years. Over the past 3 years, before coming to ChattaNeuter, Dr. Rhyne spent her time specializing in the spay/neuter arena. 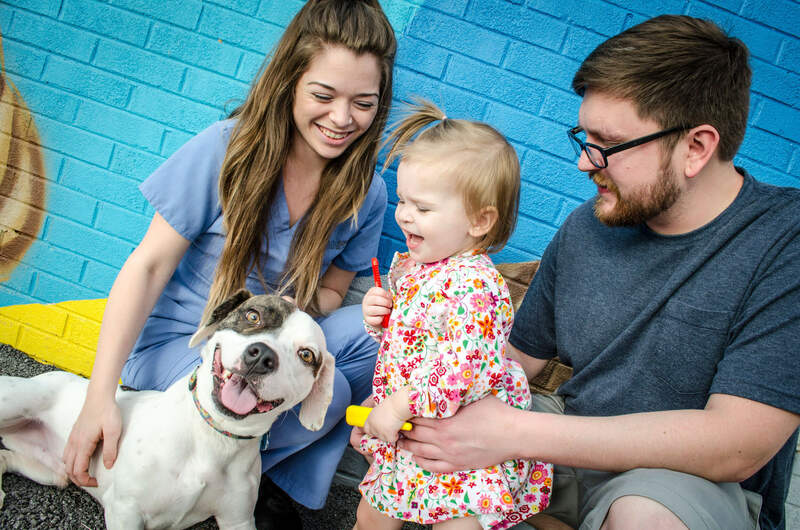 She worked with the National Spay Alliance Foundation in Dalton, Georgia, Paul’s Clinic in McMinnville, Tennessee, and the McKamey Animal Center in Chattanooga. She also works with the Humane Educational Society of Hamilton County – one of our partners – helping with exams, health certificates, and even confiscating abused or neglected animals. She graduated with a BA from Otterbein College, and after working in fields that had nothing to do with her degree, she finally decided to get serious about her love of animals and desire to care for them. Throughout her life, she has volunteered at animal shelters in her home state of Ohio, as well as with local Therapeutic Riding classes and clinics. Jen has worked in high volume spay and neuter facilities since 2011, and she has trained at the Humane Alliance in Asheville, NC. She loves working with cats and dogs, educating the community on the benefits of spay/neuter, and making a difference in families' relationships with their pets through her job. Jen has owned pets in every discernible shape and size, caring for mice, rats, hamsters, iguanas, chameleons, geckos, tropical fish, and African millipedes (not all at the same time)! She has been a licensed practicing veterinarian in the state of Tennessee for 9 years. Dr. Smith has been in the field of veterinary medicine for over 18 years, starting her career as a licensed veterinary technician. She has worked at several veterinary practices as well as at McKamey Animal Center as the surgical veterinarian.She is a member of the AVMA, AHVMA, IVAS, HCVMA and TVMA. Tricia graduated with a Bachelor’s in Nonprofit Management giving her a solid foundation for work in the animal welfare field. After graduation Tricia worked at the Humane Educational Society where she developed skills for engaging the community in coalition building and fulfilling the shelter’s mission to save more lives. Tricia later worked at McKamey Animal Center. As part of the senior management team she played an essential role in decision making and program building. Since March of 2015 Tricia has worked as Director of the ASPCA Northern Tier Shelter Initiative. As Director she works remotely and onsite with agencies in the Northern Tier providing mentoring, training, grant distribution and follow up. Most recently Tricia became a Certified Animal Welfare Administrator, one of only three in the state of Tennessee. She is an accomplished, creative, strategic leader and mentor with expertise in managing and directing all facets of non-profit organizations. Karen is the former executive director of the McKamey Animal Center that was named the Chattanooga Chamber of Commerce Non-Profit of the Year during her tenure. She is proud to be a Chattanooga Woman of Distinction and to be appointed to serve on the state Board of Veterinary Medical Examiners. She graduated from Blue Ridge in Virginia with a degree in veterinary technology and has continued her education achieving the highly respected designation of Certified Animal Welfare Administrator. Previously she served four years as board chair of the McKamey Animal Center, and produced numerous fundraising events for the Center. Ms. Ball is employed at Chattanooga Presents, a special events firm, and her expertise is in organizational efforts for not-for-profits and production of such large events as Nightfall, 3 Sisters and Pops on the River. With over 40 years of special events experience, she will be instrumental in organizing fundraising events for ChattaNeuter as well as the experience she brings from numerous board positions. Founded in 2017, our passionate and experienced team continues to grow. We’re eager to find new talent that believes in our animal welfare mission. Unfortunately, we don't have any openings. But, keep checking back in for any future opportunities.